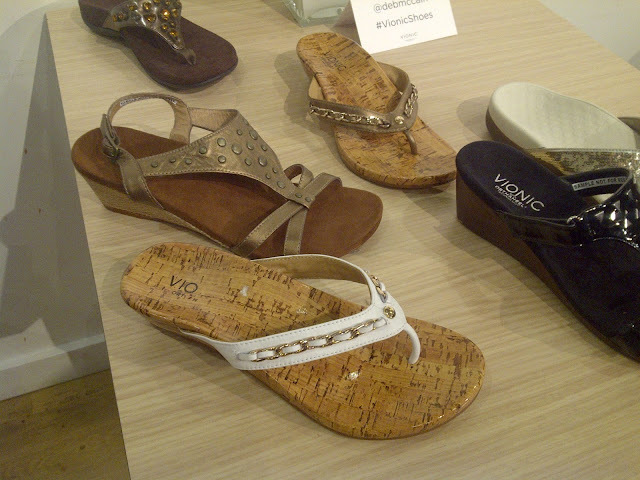 Waffling: Vionic Shoes Spring Preview! 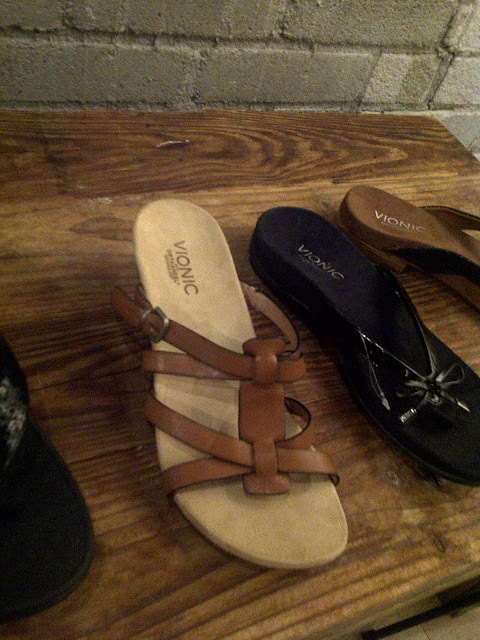 Last night I was invited to the a preview event for Vionic Shoes (recently rebranded from Orthaheel). It is a great company that works to mix supportive shoes and still allowing my feet to look cute! Their current line is kind of small and simple, but they are expanding next spring into TONS of adorable sandals. I have talked before about my foot problems and how my arches fall and my right foot pronates. I have no issue dropping some cash on a comfortable shoe (if I am wearing them every day I intend to be comfortable! ), but I have been let down by my last couple of pairs of "good quality" shoes. Therefore I was very excited to check out this company and see what they have got to offer. The event was at Hotel Ocho and was soo nice! The drinks and food were very yummy and I even got a free pedicure and foot reflexology session. Um yes, my feet were feeling pampered! I was nervous about going and not knowing anyone, but I ran into a couple of bloggers that I knew so I often had someone to chat with. 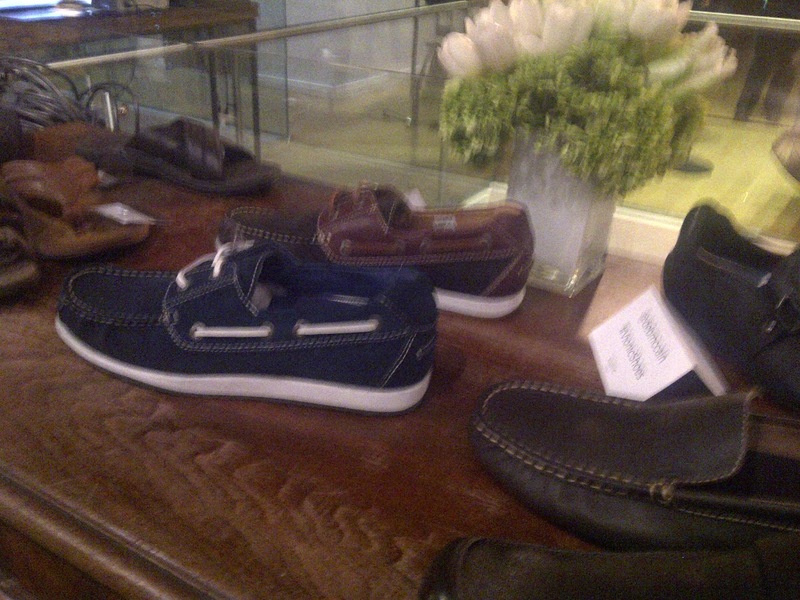 The mens line- loved those navy boat shoes! I learned a lot about their shoes and I was SUPER impressed with the support. There is amazing arch support in the shoes. Their basic premise is to give you the support of custom orthotics for less. They design the shoes to give us back our natural footprint, which is taken away from walking on flat, hard surfaces all day. I had a great talk with the reflexologist (Sally from Esthetics by Sally) about how a lot of our health manifests in our feet and how the feet support so much of our body! It was amazing how much she can tell about your health from your feet- she was even able to tell which of my feet pronates and that I was feeling a bit bloated. Another person said she was able to tell she had recently had a cold! So yes, happy feet= important. Good shoes= happy feet. The pedicure was super cute- they used stickers! No dry time and they are super adorable! I am very excited to check out the full line when it launches and I will be sure to give you a review of the shoes that I get! Please note I was invited as a guest to this event, but I was not asked to write about it. This post is entirely my opinion on Vionic Shoes. I really was that impressed! Ah - I love them too! I am so looking forward to trying their flats when the line is released this Feb!